Spring is on the way! The calendar tells me it is! It’s March 1 on Friday! I know it’s hard to believe with the weather we have been having. Normally, our winters are usually over by mid-February—sometimes a small dusting of snow would happen on an early morning in late February or early March, but that bit of snow would be gone within a few hours. I am ready for this cold, snowy weather to be over, and I’m sure that most of the people in the Spokane area are ready for it to be over too! Springtime makes me think about parks! We walk our two dogs at the many pretty parks in Spokane and the Valley. We’re ready to get out and walk through our beautiful parks again! For years, when I’ve driven by Manito Park on Grand Boulevard, I’ve noticed the trough in the parking strip beside the street. I’ve never stopped to see if the marker gives any facts about why the trough is there, but I’ve searched online for information to no avail. Last week, researching for that post, I found the answer! The concrete trough in the parking strip is the actual horse trough installed in 1907 for the stagecoach horse teams traveling up the Grand Boulevard hill to water their horses! That makes total sense now as I always wondered what is a water trough doing on Grand Boulevard! Until last week, I didn’t know that stagecoaches had ridden through Spokane! I thought the only zoo in Spokane was the Walk In The Wild Zoo in the Spokane Valley. Much to my amazement, I discovered last summer while looking for ideas to write about for the EWGS Blog, that Manito Park also had a zoo! The Manito Park Zoo was the main centerpiece of the park from 1905 to 1933—created out of about a third of the donated land or 30 acres. The goal of the zoo was to display animals that were not native to the Spokane area believing that would generate more interest in the zoo. Some of the animals on display were: crow, owl, elk, deer, buffalo, kangaroo, muskrat, beaver, monkeys, coyote, emu, ostrich, pheasant, fox, racoon, bobcat, cougar, pigeons, ducks, a golden eagle, and brown, black, grizzly, and polar bears as well as ducks, geese, and other birds. Another area near Rose Hill were small cages that kept skunk, coyote, bobcat. The rock building that today houses The Park Bench Café, was the Peanut Shack during the zoo’s time. Zoo visitors could buy food and drink for themselves as well as peanuts for the monkeys. As the news of the Manito Zoo spread, Tacoma, Washington, gave the zoo a mature bull elk—Old Preach. So that Old Preach wasn’t friendless, a roommate was provided in a young billy goat called Billy. Billy the goat chewed tobacco “like a thresher hand”, and Old Preach picked up the habit. Old Preach frequently tried to mooch tobacco from visitors. A pair of grizzly bears came from Yellowstone National Park, Glacier Park provided six elk, three bucks, and three does. Kansas sent four buffalo. In 1913, the first baby elk was born—his mother was from Yellowstone. His name was PowWow the First. In 1916, the first baby buffalo was born. The polar bears came by way of a discharged soldier from Tacoma who had brought home with him two baby polar bear cubs. They soon were too large for him to handle; his parents put them up for sale, and Manito Park bought them for the zoo. Funny animal antics aside, there were also some devastating incidents between certain animals on several hot summer days over several years. I’ll leave it up to you to look those incidents up if you have an interest. Part of the cause of the demise of the zoo was also that the zoo was in a wealthy part of Spokane, the stench and noise of the zoo caused concern among the neighborhood, and sometimes there were animal escapes. The Zoo struggled for a few years, and in 1933, the decision was made to finally close the zoo. The major reason was because of the 1929 financial crash and its effect on the Spokane economy that caused financial difficulties with the zoo. Homes were found for a majority of the animals. On January 8, 1933, the zoo officially closed. were horses, wagons, or foot to travel around the region. From 1851 to 1864, in the Spokane Valley, a new mode of transportation was available. Antoine Plante, a French- Canadian man and a Hudson Bay Company trapper, built a ferry across the Spokane River just east of where Millwood is today. The ferry was named Plante’s ferry, was 40 feet long and was pulled across the river by pulleys and cables. At the time, the ferry was the only way across the river; it transported people, wagons, and animals. The military were frequent users of the ferry. The ferry quit operations when the Spokane Bridge was built in 1866 just upstream from the ferry. Between 1859 and 1862, the 611 mile trail--Mullan Military Road--was built and was the most important road through Spokane. The road travelled between Fort Benton in Montana and Fort Walla Wall southwest of Spokane. The US Government commissioned Captain John Mullan to build the road. The road crossed the Palouse and nearby scablands, crossed Plante’s Ferry, and into present-day North Idaho. Wells Fargo and other stagecoach lines were introduced to the Spokane area is 1866. The stagecoaches brought in passengers, as well as mail from the east and the west. One of the main routes was between Spokane Falls to Colfax. This main route quit running with the arrival of the railroads but most of the shorter routes ran through the 1920s. On June 25, 1881, Spokan Falls saw its first train—the Northern Pacific Railroad. This line travelled over the Rockies from the east and then down to the Columbia River gorge. Another line--the Transcontinental Railroad, connected the Eastern United States lines with California. This line was completed in Montana in 1883. This railroad line created a nationwide network that transformed the population and the economy of the Western United States. Spokane Falls saw its first Transcontinental Railroad train in September 1883. The train made it possible for the region to ship their lumber, grains, goods, and ore to the rest of the country. TheNorthern Pacific Railroad (1881), the Oregon Railroad and Navigation Co. (1889), and the Great Northern Railway (1892) relied on Spokane’s railroad terminal. There were also shorter or feeder lines. These linked with other transcontinental lines. Some connected Spokane to mining towns throughout the Pacific Northwest. In 1887, Daniel Chase Corbin built the Spokane International Railway; this line ran between Spokane and Kingsgate, British Columbia. The Union Pacific Railroad bought out this line in the 1950s and was renamed the Spokane International Railroad, and is still in business—an important connection between southern British Columbia and the Northwestern States. The Spokane, Portland & Seattle Railway was another railroad line through Spokane. It was built in 1905 by James Jerome Hill, a Canadian, who also built the Great Northern Railroad. Hill was nicknamed, the “Empire Builder.” This line was a joint venture between the Great Northern Railway and the Northern Pacific Railway. It ran along the north bank of the Columbia River. By 1970, the Northern Pacific Railway merged with the Chicago, Burlington & Quincy Railroad and the Great Northern Railway to become Burlington Northern Railroad. Doors open 8:00 a.m., Registration at 8:30 a.m., Seminar begins: 9:00 a.m.
Do you remember when Spokane had the afternoon newspaper, The Spokane Chronicle (publication ended in 1992), and the morning paper, The Spokesman-Review? When my mom, dad, sister and I moved to Spokane in the summer of 1969, both papers were in existence. We subscribed to the Spokesman-Review newspaper. Until researching today, I didn’t realize back in 1969 that the Chronicle leaned Democratic, and the Spokesman-Review leaned Republican. Spokane’s newspapers—The Chronicle and The Spokesman-Review--have a long complicated history and many name changes. As I researched for this blog post, at times keeping the two newspapers apart was confusing. 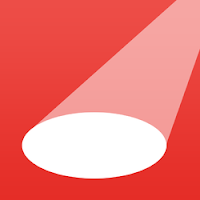 To make this post less confusing, this blog post is only about the history of The Spokesman-Review! In May of 1883, the first edition of the Spokane Falls Review was published. Frank Dallman, editor, had grown up in a Midwestern newspaper family, had moved to California to run a newspaper, but had thought Spokane would be a good market for a newspaper. Dallman favored a Republican leaning newspaper; Spokane already had a Democratic leaning paper—The Chronicle had been publishing since 1891. Spokane Fall’s city leaders thought that Spokane could support two papers and were happy to endorse a Republican leaning paper. The population of Spokane Falls in 1883 was around 1,500 residents. Dallman set up shop, purchased a printing press, and started publication. By 1887, Dallman had sold out to the two partners that he had acquired over the past four years. Eventually, two papers could not be support two daily newspapers. The Review (Chronicle) talked to the Spokesman about consolidating the two newspapers in 1893. The agreement was made, and four partners changed the name to The Spokane Review. The financial panic of 1893 in Washington State began in January 1893. 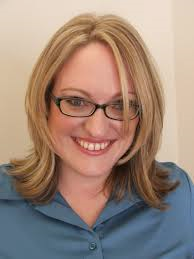 The panic hit Spokane hard, and three of the four partners were devastated financially. In 1894, partner Cowles bought out the other three partners, and he renamed the paper The Spokesman-Review. From the publication of the first edition of the Spokane Falls Review to the name change to the Spokesman-Review only eleven years had passed. 1894 circulation was around 4,000; 1900, above 10,000. According to Wikipedia, The Spokesman-Review has the third highest readership among daily newspapers in Washington State. It is also one of the few remaining family-owned newspapers in the United States. 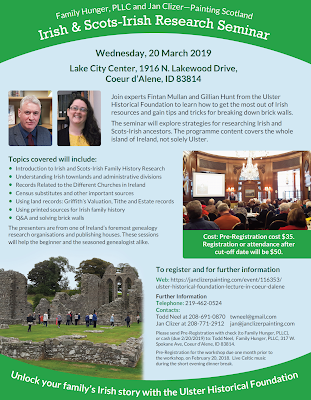 Join Fintan Mullan and Gillian Hunt from the Ulster Historical Foundation during their annual United States lecture tour to learn how to get the most out of Irish resources and records, gain strategies for breaking down brick walls, and grasp important historical context that may help fill in gaps in your research. 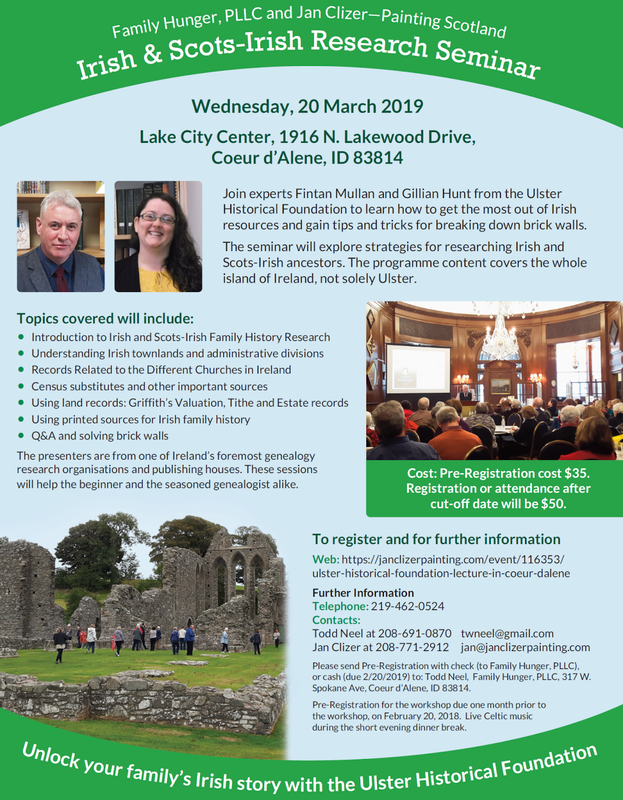 Program title: Irish & Scots-Irish Research Seminar! Cost: Pre-Registration cost $35. 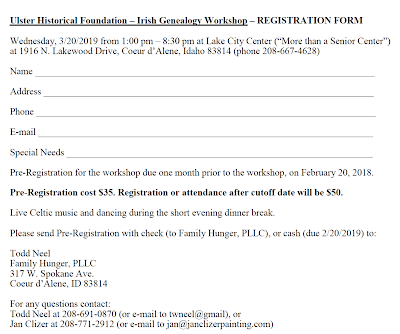 Registration or attendance after cutoff date will be $50. 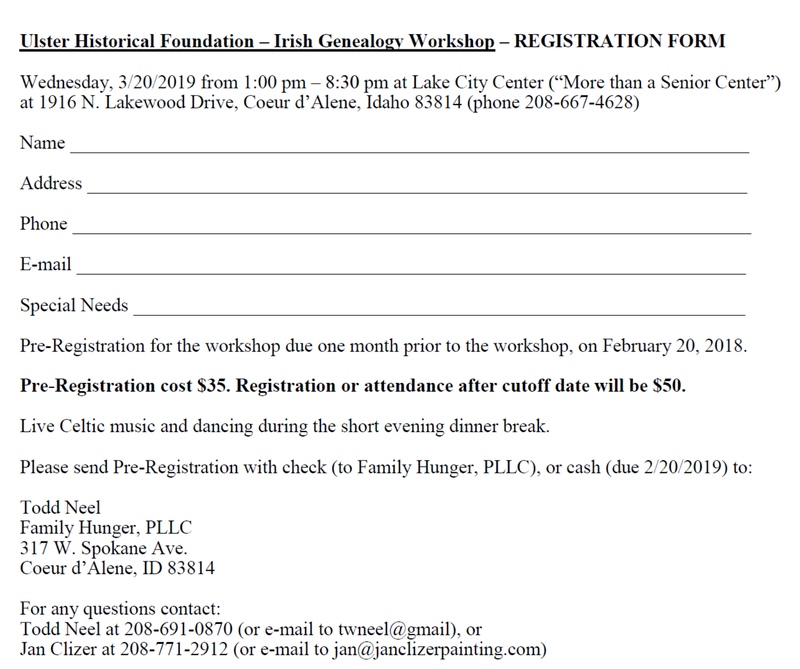 Please send Pre-Registration with check (to Family Hunger, PLLC), or cash (due 2/20/2019) to: Todd Neel, Family Hunger, PLLC, 317 W. Spokane Ave, Coeur d’Alene, ID 83814. Pre-Registration for the workshop due one month prior to the workshop, on February 20, 2018. Live Celtic music and dancing during the short evening dinner break. 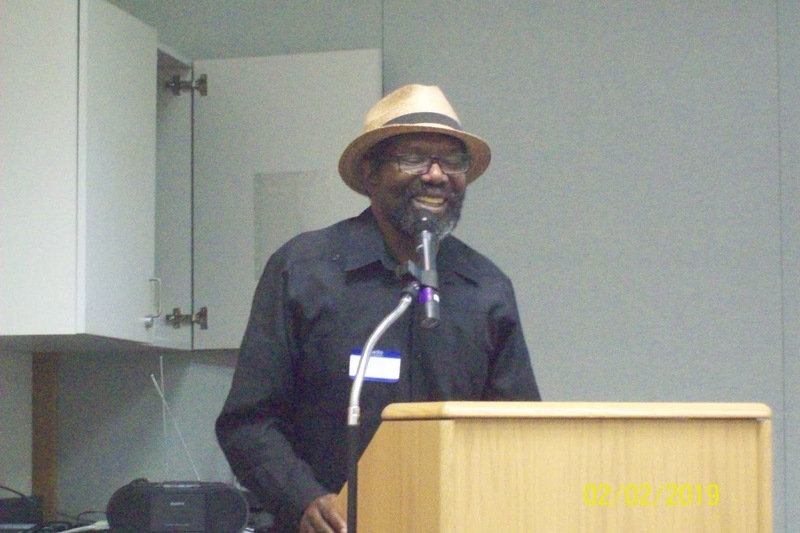 In honor of Black History month, Spotlight on Spokane shines a light on local accomplished educator, poet, writer, and radio host, Mr. Stephen Pitters. 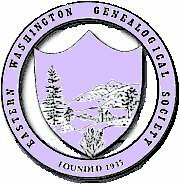 At our most recent Eastern Washington Genealogical Society (EWGS) meeting this past Saturday, we had the pleasure of meeting Mr. Pitters. 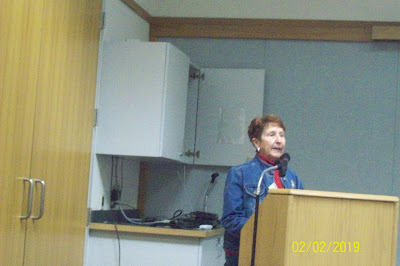 His presentation was engaging and captivated the audience with humorous and honest anecdotes about his life and undertakings to uncover and discover family history records beyond the United States. Mr. Pitter’s history, while unique to finding difficult historical records of his black ancestors, was relatable to all who have ventured to discover ancestral evidence. After years of research and with pen in hand, he arrived at the South Hill Library ready to continue the arduous task of uncovering clues to his past. The staff recommended he go to the main Spokane Public Library to investigate their genealogy holdings. While downtown, he engaged volunteers of EWGS, who were immediately absorbed into his research and asked that he share his experience with all members. The speaker has successfully traced his lineage back to 1778. His extensive research into his family story includes Jamaica, Costa Rica, and Panama. It is his own immediate line of Pitters, along with Beadle, Sleigh, and Wood, that led him to delve into microfiche about St. Elizabeth, Jamaica. It was on this microfiche where he discovered names for Pitter and excitedly thought that he had found his family at last. However, he soon realized that this list of surnames didn’t include the letter “s”; that made him question the findings. He then shared with us an interesting theory about naming traditions of American slaves. He asserts that when American slaves became free in the 1830s a letter was added to or taken away from the last name to denote than an individual was no longer a slave. This was the first I had heard this interesting theory, and I am confident it news to other attendees. Among those who have researched for years, there were knowing nods and smiles as we reflected on our own laborious journeys of researching and discovering ancestors on microfiche. Before closing, Stephen read a few selections from his published poetry books. 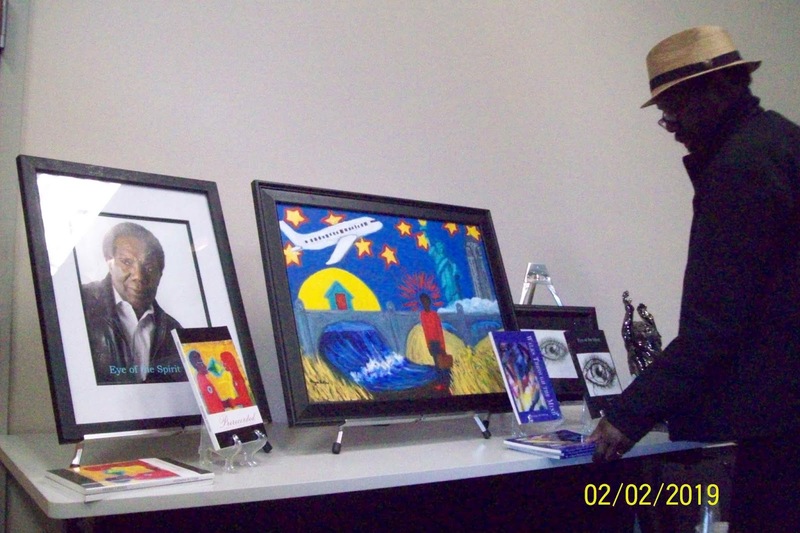 His writings reflect on his life, as well as others. As a proud father, Stephen shared his admiration and appreciation for his daughter who created the art work covers of his last two books! You know the old saying, talent runs in families! Stephen believes the most important thing we can pass down to our children and to the next generation is our own unique family histories. Because of this belief, he has chosen to spend countless hours methodically researching to ensure accuracy. The audience was fortunate to be able to hear a taped conversation of Mr. Pitter’s 100 year old grandmother and that was a treat for all! After listening to Stephen’s presentation, I was reminded that research takes different forms, and each requires patience and time to gather treasured pictures, documents, oral stories, etc. I will definitely try to be more patient in my own personal research. I have only just begun my journey of finding my ancestors—I have a long way to go. And I am also reminded that this labor of love is never really over because there will always be stories to be told and new discoveries to be found. To celebrate Black History month EWGS had Stephen Pitters come and tell about his genealogy and life as a black college student in Louisiana in the 1960s.